All set for some thrilling semis. Eight becomes four, and I know at this stage you are just begging for more. I can't remember a more exciting time in football, and the two fixtures coming up have a huge role to play in this. Those quarter-finals certainly rocketed us into the final week of the tournament, and it's a final week without big favourites Brazil and home team Russia. Belgium outplayed the Brazilians in regulation time, whereas the Russians took Croatia to the bitter death of penalties. Uruguay also fell away thanks to France, so that means there are only European teams left in the reckoning. Onto those final four then, and what I like to call the games of the favorites and the underdogs. When Belgium decided to win the game against England (that nobody wanted to win), they chose the tough road to the final. A win against Brazil now sees them face red hot France as the last obstacle to this goal. They certainly have the team to do it, this is after all their 'golden era' team. Whatever Belgium bring to the field, France can match and in places even raise them on. The talent is everywhere and so are the goal scoring threats. You think by containing Mbappe and Griezmann you are doing okay, but then suddenly Giroud pops up in the box. There are elements where these teams will cancel each other out, but when you see what is left France certainly have the edge. Are both teams lucky to be here still? Croatia has been taken to penalties twice, and England have played some rather average teams. So yes, the answer can be yes. But they have both got the job done so far and that's all that matters. They both lack very real star power unlike the teams in the other match, but they both certainly also have their own appeal. This Croatian team dispatched Argentina earlier in the tournament and have since shown a real hunger for the fight. England are a fearless young team who at this stage are mostly unhindered by expectation. I know the 'it's coming home' movement is growing, but nobody really expected them to be here with an inside track to the final. I say inside track as they are going to be so much fresher than Croatia going into this one. To use a tennis analogy, Croatia have just played back to back 5 set thrillers in a grand slam. England on the other hand have had straight sets victories to get here. At this stage of the tournament where the margins are so fine this is going to be a very real consideration. So expect a few more days of hearing that 'It's coming home'. 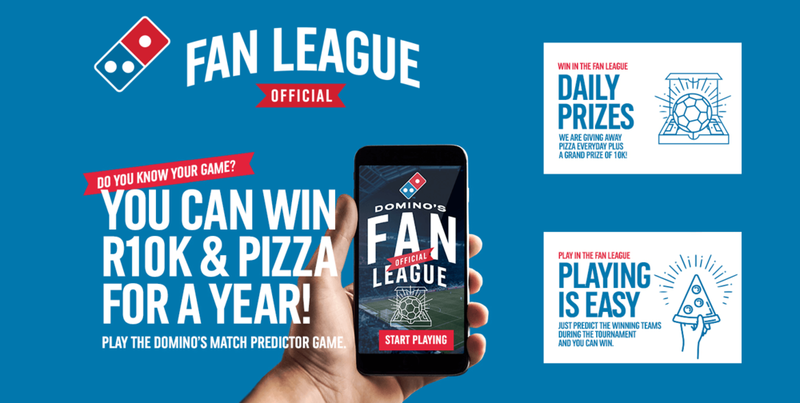 With all the info above it's now over to you to make your picks and win on the #DominosFanLeague. Even if you aren't in the running for the R10 000 grand prize, there are still smaller cash prizes to win, plus loads of great pizza.